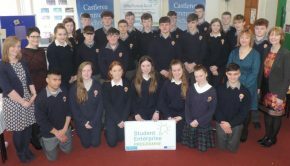 The European CanSat Competition is an ESA (European Space Agency) educational project aimed at promoting STEM (Science, Technology, Engineering and Maths) literacy amongst young European students through project-based learning. The team’s challenge is to fit all the subsystems of a satellite inside a can the size of soft drinks can! Every participating CanSat team will have to accomplish two missions: a mandatory primary mission – to collect and transmit air temperature and pressure data at least once a second by means of radio waves, land the satellilite and a secondary mission completely open to the team’s imagination! The secondary mission could be exploring a new planet, fitting a gps system, analysing the earth’s atmosphere or developing a rover to fit inside the CanSat, or anything else the team may devise. 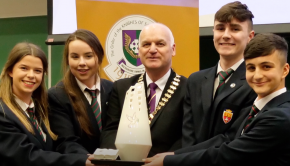 There is a third phase to the competition which involves communicating with the local community and schools, having a social media presence or designing a website and also getting media coverage for the project. On Monday January 28th. 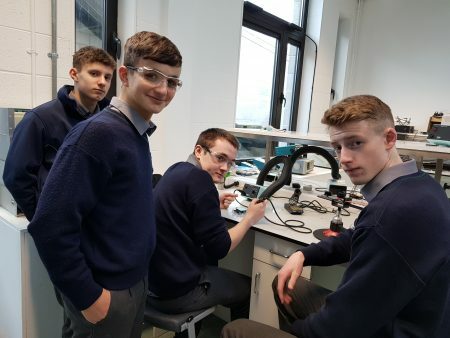 Dylan Murray, Dylan Flanagan, Ronan Tumbek, and Dawid Szczęsny, accompanied by Ms Hanbury, travelled to Athlone IT to take part in a workshop for the annual CanSat competition. When they arrived at AIT, they were greeted by Mr. Kevin McDermott. He began by explaining what CanSat involved. CanSat is a competition set-up by the European Space Agency ( ESA ). 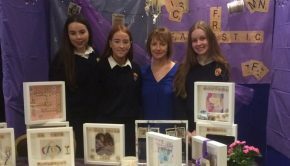 Numerous schools compete to represent their country in the final in Portugal. Ireland always came close to winning but never succeeded until last year. During their time in AIT, they managed to finish connecting the pressure sensor and the temperature sensor, as well as the radio controllers. They also managed to check that everything was working correctly. Kevin also showed the team how to program the Arduino. He gave them great tips on how to find references and guides to programming the Arduino. Overall the programming seemed very easy and logical. Kevin also gave the team guidelines about what was needed for the second mission. He gave some examples of functions they could include such as a GPS system. A most educational, enjoyable and rewarding morning was had by all. The team are now working hard on preparing for the next part of the challenge. 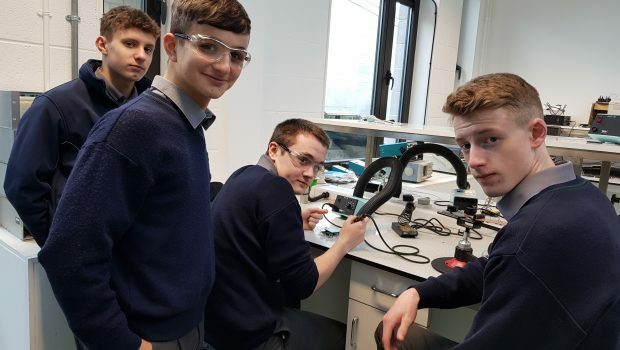 Dawid Szczęsny, Ronan Tumbek, Dylan Flanagan and Dylan Murray working hard on their CanSat project in AIT.